DESY scientists have created a miniature particle accelerator for electrons that can perform four different functions at the push of a button. The experimental device is driven by a Terahertz radiation source and can accelerate, compress, focus and analyse electron bunches in a beam. Its active structures measure just a few millimetres across. The developers from the Center for Free-Electron Laser Science (CFEL) present their "Segmented Terahertz Electron Accelerator and Manipulator" (STEAM) in the journal Nature Photonics. Terahertz radiation is located between microwaves and the infrared in the electromagnetic spectrum. One of the central features of the device is its perfect timing with the electron beam. The scientists achieve this by using the same laser pulse to generate an electron bunch and to drive the device. "To do this, we take an infrared laser pulse and split it up," explains first author Dongfang Zhang from the group of Franz Kärtner at CFEL. "Both parts are fed into nonlinear crystals that change the laser wavelength: For the generation of an electron bunch the wavelength is shifted into the ultraviolet and directed onto a photocathode where it releases a bunch of electrons. For STEAM the wavelength is shifted into the Terahertz regime. The relative timing of the two parts of the original laser pulse only depends on the length of the path they take and can be controlled very precisely." This way, the scientists can control with ultra-high precision, what part of the Terahertz wave an electron bunch hits when it enters the device. Depending on the arrival time of the electron bunch, STEAM performs its different functions. "For instance, a bunch that hits the negative part of the Terahertz electric field is accelerated," explains Zhang. "Other parts of the wave lead to focusing or defocusing of the bunch or to a compression by a factor of ten or so." While compression means the electron bunch gets shorter in the direction of flight, focusing means it shrinks perpendicular to the direction of flight. Additionally, STEAM allows to perform an analysis of the structure of the electron bunch along its path of flight. For this technique, called streaking, the incoming electron bunch is deflected sideways in such a way that it becomes smeared out perpendicular to the direction of flight. When this smeared out bunch hits a detector, it produces a profile of the bunch along its path of flight. Streaking is regularly used to analyse the bunch structures in particle accelerators. "STEAM is a kind of Swiss army knife for electron beams," says Zhang. To perform multiple functions, like compression and focusing, several units of the device can be combined. Using Terahertz radiation also allows for the compact size of the STEAM device. "Terahertz radiation typically has a hundred times shorter wavelengths than the radio frequency radiation used in today's big particle accelerators. Therefore, all the structures in the device can shrink accordingly," explains Kärtner, who is lead scientist at DESY and professor at Universität Hamburg. Measuring just about two centimetres on the largest side, STEAM easily fits into a matchbox. "And that's just the size of the housing. The active structures are on a millimetre scale," adds Zhang. The technology is still at an experimental stage. 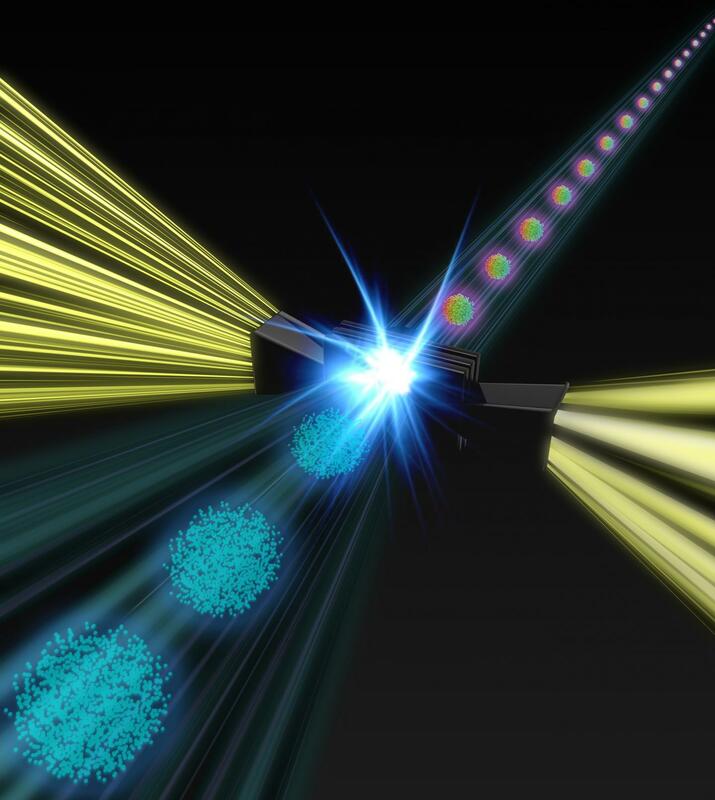 The developers see STEAM as a first step on the road to a future generation of compact, Terahertz driven particle accelerators. These could enable new applications and complement today's accelerators. Also, the pocket manipulator can already be utilised today: accelerator groups around the world are already considering it for bunch characterisation, as Kärtner points out: "STEAM can be used for future table-top accelerators, but its various functions are also interesting for existing machines." DESY is one of the world's leading particle accelerator centres. Researchers use the large?scale facilities at DESY to explore the microcosm in all its variety – ranging from the interaction of tiny elementary particles to the behaviour of innovative nanomaterials and the vital processes that take place between biomolecules to the great mysteries of the universe. The accelerators and detectors that DESY develops and builds at its locations in Hamburg and Zeuthen are unique research tools. DESY is a member of the Helmholtz Association, and receives its funding from the German Federal Ministry of Education and Research (BMBF) (90 per cent) and the German federal states of Hamburg and Brandenburg (10 per cent).